When it comes to business scanning, basic all-in-ones and flatbed scanners just aren’t good enough. Either they can’t handle your volume needs, or they aren’t versatile enough to work with the different paper sizes and shapes a business uses. In a sea of basic scanners, the Epson Workforce Pro GT-S50 is a notable exception. This is a life-saving piece of equipment for paper-heavy businesses. Law firms, medical offices and accounting departments can easily archive years’ worth of documents with the Epson Workforce Pro. It can handle up to 1200 sheets per day, making it quick and easy to empty out those old file cabinets. 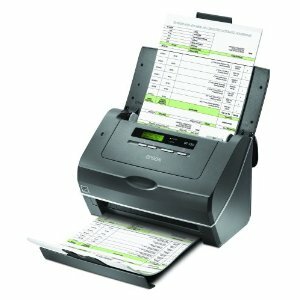 The Epson Workforce Pro GT-S50 has a 75-page feeder, so you can set it up to scan and walk away. Don’t worry about keeping everyone’s scans straight – the LCD display will make it easy to see who’s using the scanner when. On top of the sheer scanning magnitude made possible with this document scanner, it also contains some handy one-touch functions. Instead of scanning in a document and having to convert it from JPEG or other formats into PDF, the “Scan to PDF” function does the work in a single step. The Epson Workforce Pro GT-S50 scans in several different document sizes, from receipts and business cards all the way up to 8.5”x36” banner sheets. It’s capable of scanning thick plastic ID cards, but can still scan tissue-thin receipts with the help of a carrier sheet. Rounding out the Epson Workforce Pro GT-S50 are some nice bonus features. The Workforce Pro works with LED technology, making it mercury-free and energy efficient. It’s also a duplex scanner, saving both sides of a document in a single scan. It totals less than 16 pounds in a surprisingly compact unit, making it maneuverable in even the smallest of offices – no need for a separate room. About the only thing the Epson Workforce Pro doesn’t do is your taxes, though it can easily help you organize your tax documents. It’s important to note that the Workforce Pro isn’t a photo scanner, it is a document scanner. It’s capable of B&W, grayscale and photo scans with a 600dpi resolution, but that doesn’t compare with dedicated photo scanners. Apart from that, it’s hard to find anything bad to say about this scanner. 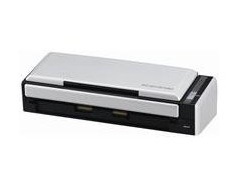 The main competitor of the Epson Workforce is the Fujitsu ScanSnap S1500. 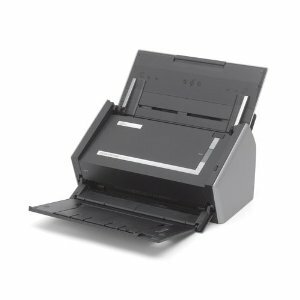 The Epson has a larger feeder tray, can scan larger documents and is compatible with both Windows and Mac computers. It is also cheaper than the Fujitsu. Yet the Fujitsu ScanSnap continues to sell better and receive better customer reviews on Amazon so it is certainly worth comparing these two models. 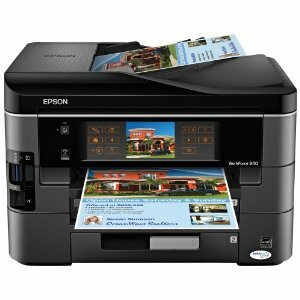 Overall though, if you need to scan in large volumes, the Epson Workforce Pro GT-S50 is certainly a great choice. While it may not be rated quite as highly as the ScanSnap S1500, it is still a top selling document scanner at a reasonable price. It also is has a bit more flexibility as far as operating system compatibility and object sizes which may be more important depending on your needs.